Greenwich's Liz Warner (15) challenges Fairfield Ludlowe's Regan Steed (2) in first-half action on Monday, Sept. 30 in an FCIAC girls soccer match at Taft Field in Fairfield. The Falcons won 2-0. Fairfield Ludlowe's fourth win in a row in girls soccer Monday night at Taft Field was sparked by the Falcons ability to win a majority of free balls. It was supported on offense by senior leadership. 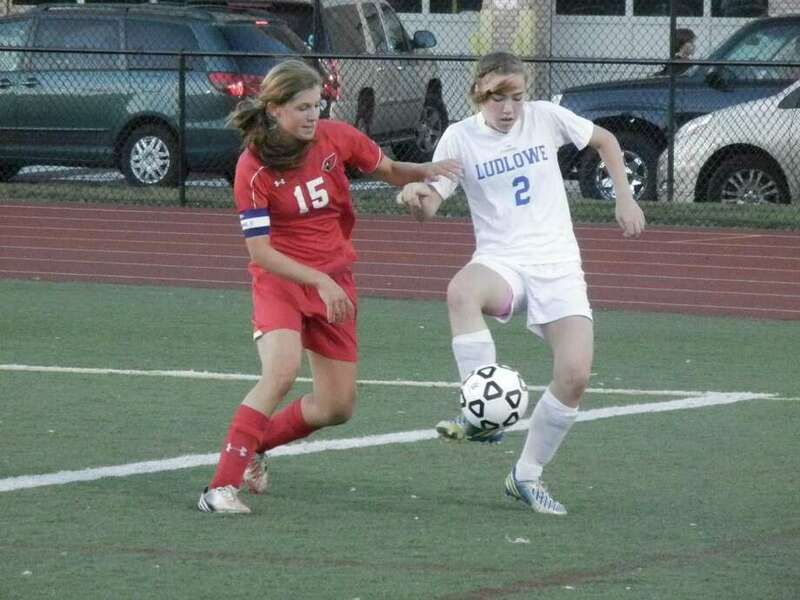 Lindsay Zilling scored a first-half goal and Krissy Bradley fired home a wicked shot in the second half to propel Ludlowe to a 2-0 FCIAC victory in Fairfield. Both are seniors. The Falcons improved to 4-4-0 overall and in the conference. The visiting Cardinals, two-time defending conference champions, had their four-game unbeaten streak halted, and dropped to 3-3-1 overall and in the FCIAC. The Falcons, who are off for three days, will prepare for crosstown rival Fairfield Warde (5-0-1), which was undefeated entering Monday's action, for a game Friday night at Ludlowe. "Ludlowe hustled and really went for the ball," said Greenwich coach Danny Simpson, who noted those Falcons' advantages over the Cardinals. "We were second to the ball. They withstood us in the second half when we put on pressure. They did a fantastic job. They earned that result fair and square. "I'm pleased with how the girls responded to our team talk at halftime," Simpson said of the move to a more attacking style in the second half. "In the FCIAC, you cannot come on to the field expecting to be given anything." Greenwich pressured Ludlowe for much of the game, but the Falcons' defense in front of sophomore goalkeeper Caroline Serniak was calm and effective when it had to be. Serniak, who made five saves, became the starter by replacing an injured goalie. "It was a team effort," said Ludlowe coach Kate Dawson. "We've been preaching consistency. That's been our mantra. We knew this was going to be the pivotal week of the season for us, playing Greenwich and Warde. It's going to come down to focus and concentration. I've been telling them they have to stay composed. "Our goalie did a great job in the back today. She has really stepped in. She's physical and vocal. It's been a seamless transition (to another goalie)." Greenwich goalie Kylie Ginsberg did a fine job by making six saves, but she was victimized twice on the goals. Ludlowe substitute Ali Gorab fed Zilling down the right wing where Zilling turned the corner on a Cardinals' defender and cut in on goal. Her low, hard shot deflected off another Greenwich defender and past Ginsberg. That made it 1-0 Ludlowe in the 19th minute of the first half. The insurance goal came in the 35th minute of the second half on a splendid individual effort by Bradley. No Cardinals' defender could close down the space on her, so Bradley unleashed a powerful shot up high from close to 25 yards out straight on Ginsberg. It would have been tough for any goalie to react in time. Greenwich peppered three shots toward Serniak in the opening three minutes of the second half, but the Cardinals' next shot on goal didn't arrive for another 10-plus minutes. The second of those three shots when through Serniak and bounded off the crossbar. "When we started going on offense, we couldn't get the ball in," Simpson said. Records: G--3-3-1, 3-3-1 FCIAC; FL--4-4-0, 4-4-0 FCIAC. Goals: FL--Lindsay Zilling, Krissy Bradley. Assists: FL--Ali Gorab. Goalies: G--Kylie Ginsberg (6 saves); FL--Caroline Serniak (5 saves). Shots: G--10; FL--9.